The following article appeared in the Daily Post and includes a video of me speaking to the Journalist Steven Bagnall as the fight to #SaveWILG intensifies. 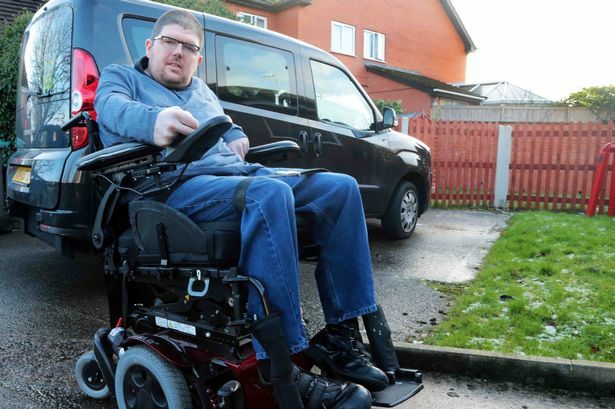 A disabled man says he will continue fighting for the rest of his life against Welsh Government moves to scrap a grant to help him live independently. Nathan Lee Davies from Wrexham, made the pledge after social care minister Huw Iranca-Davies indicated this week ministers are pressing ahead with the plan to stop the Welsh Independent Living Grant (WILG). The £27m fund is paid to about 1,300 disabled people in Wales to allow them to live in their own homes. But the cash is currently being transferred to local authorities and by the end of March next year they will assess and decide on care packages. Mr Davies, who is campaigning against the move, fears the money will be absorbed into struggling council’s cash-strapped budgets and will see the 86.5 hours he currently receives massively reduced. He has friedreich ataxia disease which damages the nerve system. It has left him needing an electric wheelchair to get about and extensive care to live alone. “We were on a massive high after the Welsh Labour conference voted to oppose the moves,” Mr Davies said. “But after what Huw Iranca- Davies recently said, it is massively deflating. I do fear I may become trapped in my house. “I feel like I am wasting precious time fighting this – I am 41 and the average life expectancy for someone with my condition is 35. A Welsh Government spokesman said no individual would lose their current payments until they have worked through and agreed their support package with the council. He said: “Welsh Government and councils in Wales are determined to support independent living for all disabled people, recognising that independent living is key to a full and satisfying life. A Wrexham council spokeswoman said the authority is following the Welsh Government process and working to review all people in receipt of the WILG. She said: “It is not possible to predict what the outcomes will be for individuals. “However, we do not simply remove care and support from people who need it. “We do work with people to identify alternative ways for them to meet their support needs where it is appropriate.